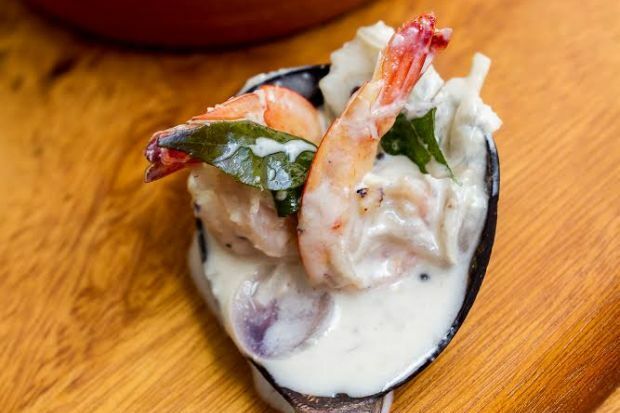 This prawn curry originated from Kerala, India. This unique curry was influenced by the British back in the early days. Back then, people couldn’t take food that were too spicy, so they invented this stew-based curry that was not too spicy. Nonetheless, this curry still uses traditional spices typically used in Indian curries, such as curry leaves, fenugreek and ground pepper. This curry is one of the easiest to make. You can have it with rice and even baguette slices. Slice shallots, ginger, and garlic. In a skillet, heat the oil, then add garlic, ginger and curry leaves and sauté for a few seconds. Add shallots and continue to sauté for another 5 minutes. Then lower the heat, add coriander powder and fenugreek powder, and stir for a few seconds. Toss the prawns into the skillet and cook over low heat until they turn pink. Then, pour the coconut milk and bring to a light boil. If you want to add colour to your curry, you can add in a few teaspoons of turmeric to give it that bright orange colour.